A while ago, I wrote about AND – that extra thing you bring to life each day. That thing which gets you noticed. I even went so far as to write a mANDifesto and note why actually writing it out is important. Little things can matter and rub off on those around you. When you attune yourself to it, you’ll notice the AND out there and it can shift your expectations on a daily basis in a positive way. Here are some examples. Unless I’m fortunate enough to be in meetings all day (OK – blessing/curse), I can easily spend multiple hours of a day on conference calls. I’m not consistently late to every call I’m on which means I listen to hold music for maybe 17 minutes while I work. I’ve never timed it but since I need to turn off my own music to dial in, the pathetic quality of the hold music I listen to is readily apparent. I know I should focus on the reliability of the call itself since that’s the actual product I use. However, turning off a digital stream of every song known to man in order to listen to hear something worse than 8-track quality for 4 minutes seems just wrong. Then I signed onto another company’s ReadyTalk conference early. The call went just fine but the music was actually upbeat and clear. 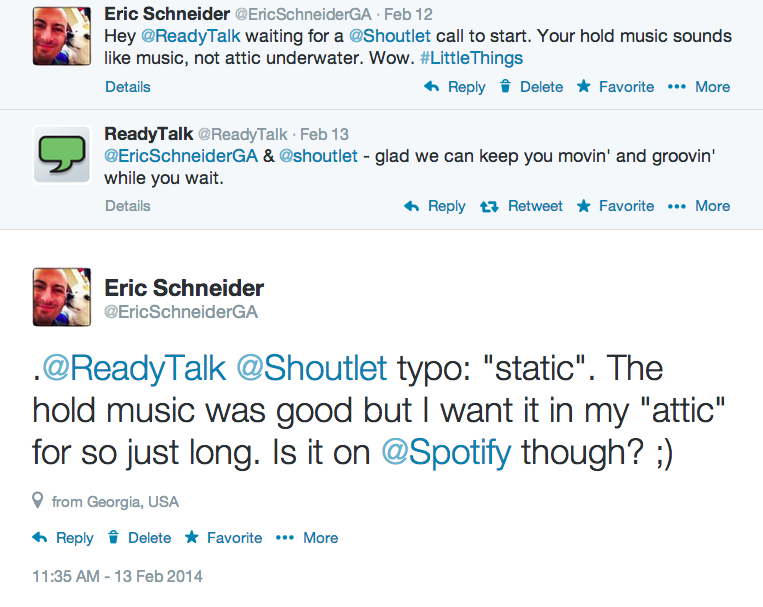 The difference was so shocking that I tweeted about it and was actually answered. Somehow that set the tone for the whole call in a positive way. A small AND, but it was there. No more static in my attic. On another recent occasion, I participated in a customer event my company hosted. These days when you get 200+ people in a room, there’s going to be live tweeting and a hashtag to tie it together. After the welcome and opening talk, I’d already followed and been followed by a couple other attendees as we talked about the content in real-time. Then Laura Ramos of Forrester Research got up and delivered a good presentation. By “good”, I mean “solid, insightful, and relevant material delivered crisply and warmly but not life-changing”. Laura had an AND though. Laura did her own live tweeting while she was talking. It took the rest of us on Twitter a moment or two to realize she’d used an app to schedule her tweets in advance. That showed an entirely new level of professionalism. First, she’d thought of a broader audience than those in the room and what her brand could be to them. Second, she crystalized key points into 140-character tweets which were attractive morsels ready to be retweeted. That actually made it easier on her live audience plus her virtual one. Lastly, the tweets were all perfectly timed. She’d rehearsed the presentation content and pacing precisely. Amazing the kind of AND you can find in a few tweets! Scheduled tweets while presenting – Simple yet brilliant! My last example was on the way in to go see a customer in their office. Our group was a little early and the day was nice so I found myself standing outside enjoying the weather and finishing a phone call. I was already in a decent mood then noticed a lady walking in from the parking lot. She had a song playing aloud on her phone and was singing along. It was enough to make me smile, walk back to the door, and open it for her. That got a smile in return and a comment about chivalry not being dead. In a day when most people tend to walk around wearing headphones and tuning people out, this was a great example of openness and just being happy on a pretty day. Each one of these cases is just a small thing but can add up to more. It actually takes a little work to notice the little things which can either annoy you or bring a little joy. It could have been so easy to be annoyed with the lady walking to the building because she was playing the music out loud. 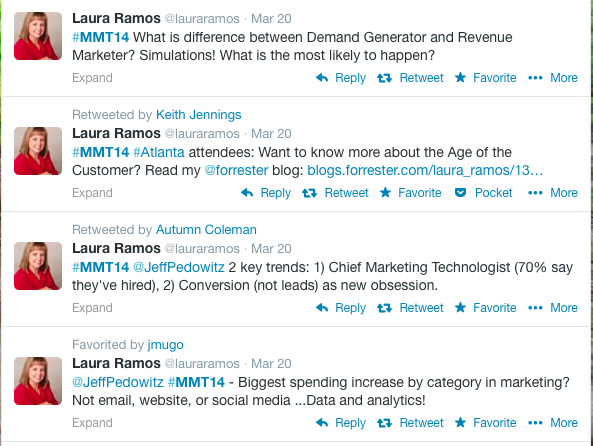 Likewise, Laura Ramos could have relied on the audience to tweet her key points on their own. She has probably already taken this for granted as part of her repertoire and has moved on to the next step – figuring that this was good enough. Boundaries get pushed by making today’s “exceptional” into tomorrow’s “good enough”.